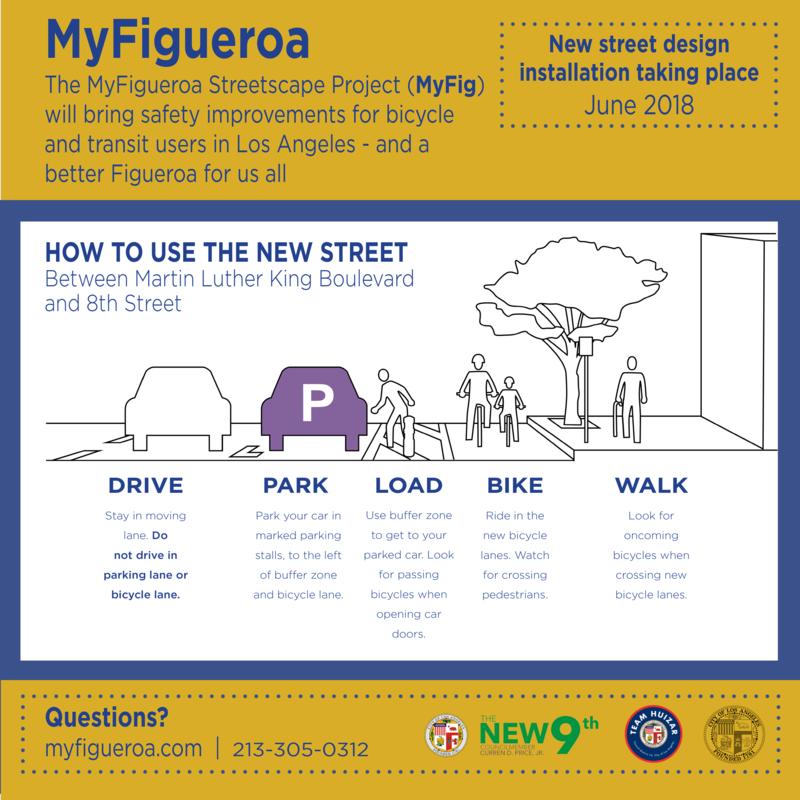 As the Los Angeles Department of Transportation begins rolling out the MyFigueroa Streetscape Project (MyFig) construction improvements for safety, all corridor users should note to adhere to the modified street design, particularly regarding red curbs and bike lanes. To make sure all Angelenos are safe as the new street design installations take place, LADOT has been working with CD 9 Councilmember Curren Price, CD 14 Councilmember José Huizar, businesses, and stakeholders to distribute information along the corridor on how to use the street improvements. Park: Park cars in marked parking stalls to the left of buffer zones and bicycle lanes. Adhere to parking signs and colors along the curbs. Load: When adjacent to a protected bicycle lane, use buffer zones to get to parked cars. Look for passing bicycles when opening car doors. Bike: Ride in the new bicycle lanes. Watch for crossing pedestrians. Transit: Safely cross the bike lane to the bus shelter for public transportation. Sidewalk: Look for oncoming bicycles when crossing new bicycle lanes. Figueroa Street improvements are active and open from Exposition Boulevard to 8th Street though safety measures are still being made. LADOT is planning to install additional bollards by the bicycle lanes around the Los Angeles Convention Center. The department is also working with special event planners to identify and establish areas for passenger pick-up and drop-off. MyFigueroa was funded in 2010 by a Proposition 1C grant under the custodianship of the Community Redevelopment Agency of Los Angeles (CRA/LA). The project is fully supported by Councilmember Price, Councilmember Huizar, and Mayor Eric Garcetti as a signature project for Los Angeles. Besides advancing the City's Mobility Plan, MyFigueroa also helps achieve the goals of Vision Zero and Huizar's DTLA Forward. A community grand opening is being planned for later this year, and we will post info about that as soon as it's known. Thank you for helping to Fig out safety on MyFigueroa!